Zaha Hadid’s experimental volumes and sweeping curves live on in a contemporary jewellery collection that the architect created with Danish jeweller Georg Jensen prior to her untimely passing. 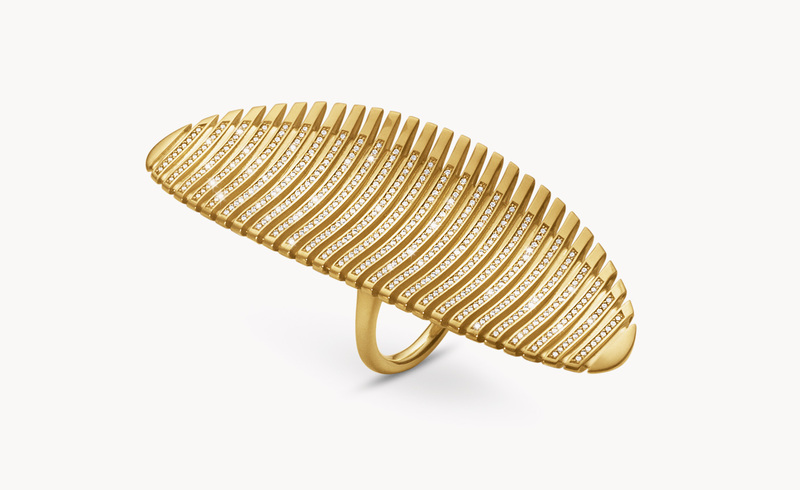 The sculptural collection of rings, inspired by Hadid’s design for the Wangjing Soho Complex in Beijing, was launched by Georg Jensen this Spring at the Baselworld watch and jewellery fair. That first suite was created in Jensen’s trademark silver, with black rhodium accents. Now the collection takes a more precious turn, this time cast in yellow gold with pavé diamond elements. Continuing the Danish house’s tradition of working with external designers to create jewellery ranges, both names were a natural fit. Zaha Hadid is the second architect to collaborate with Georg Jensen: Jean Nouvel designed a collection of flatware in 2004.